Not pictured here are some boxes, C rail, and the new feature that will be shipped to us. 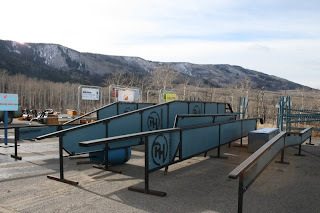 I took snowboarding lessons last year at powderhorn...and later in the season participated in the Jeep Challenge terrain park day. I am 45 yr old novice rider transplanted from Kansas. I really like the options in the parks....so its good to see improvements and expansion in that area. Snowboarding totally rocks...looking forward to another season.